Fun, enriching and fulfilling. Is this how you would like your pre-schooler to experience every day in their preschool life? From 4 Mar to 30 Apr, we would like to invite you and your child (aged 18 months to 5 years old) to experience a day in the life of a Kinderland child. 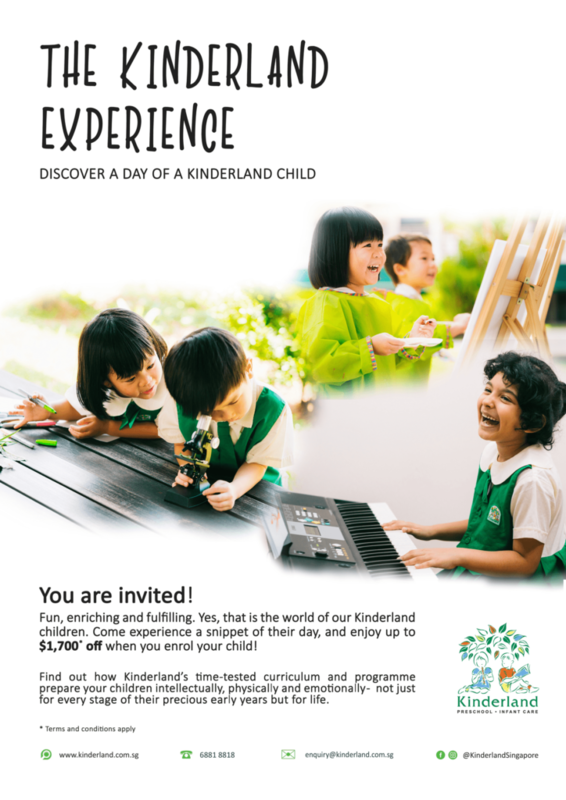 Join our class to experience 1 of our 3 unique programs (Children Music Program, Literacy through I.T and KinderFit) + centre tour. Meet our academic team who will share more about the curriculum and programmes that we offer for your little one(s). Make an appointment with us and enjoy discounts of up to $1700* when you enrol your child in the participating Kinderland centres. *Terms & Conditions apply. Contact us for more information.